in the trending color of GREEN! Yes, I’ve heard that green is the color for spring 2017! I don’t see green a lot, so this will be something new and fun to look forward to! And this dress is so light and floaty and feminine and comfortable! It’s from Anthropologie and I just got it, but can’t find it on-line for some reason. 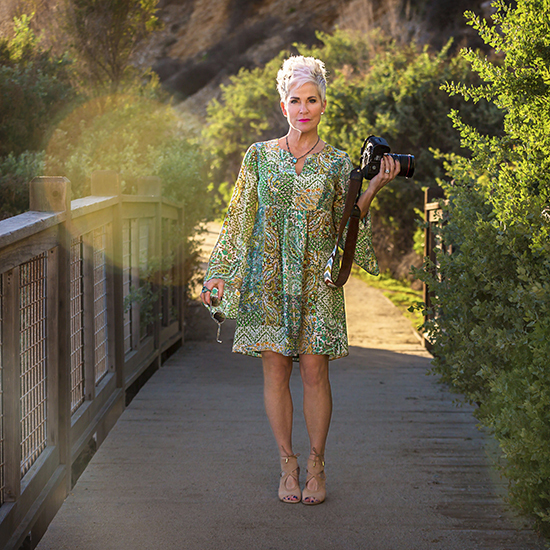 This passed weekend, I was in LA working on a campaign celebrating 50+year old women. I can’t wait to tell you about it! It was such an amazing experience for me and I felt so honored to be asked to head it up! each one with her own style and beauty! I left feeling so uplifted and empowered to be a STRONG woman at mid-life. Thank you ladies….we missed Deborah @fabulousafter40 but hopefully next time! I am so excited that I found your blog! I am 55 and your blog has been so inspiring! I need all the help I can get. I have always taken care of my skin and tend to spend my money on that, but my goal for 2017 is to concentrate on my wardrobe and other areas. I want to feel pretty at 55! Thank you again! Love your blog! Can you share the shoes? Are they AQUAZZURA? The style of these dresses remind me of the 1960’s. I love them! And yes, that makes me “chic over 60”!